Data showed that in 2013, stroke was the second-leading global cause of death behind ischemic heart disease, accounting for 11.8% of total deaths worldwide and a leading cause of disability., The magnitude of the problem is even greater in Indonesia, being the leading cause of death accounting for 21.1% of them, surpassing the ischemic heart disease. Knowing the risk factors involved in stroke is essential to reduce the incidence. For the general population, knowing risk factors involved in stroke may help the individuals to be more aware and actively preventing the disease in themselves and other people related to them. For medical personnel, astute knowledge is important to help them to screen, advise, and address the risk factors in patients. For nonmedical personnel, the insight of sign and symptoms of stroke is essential to shorten the period between onset of symptoms and medical care. There was a saying that in stroke, “time is the brain,” and the prognosis may differ largely if the patient presented/diagnosed early. Ischemic stroke patients might be able to get reperfusion treatment if they presented within the requisite timeframe. An individual educated in such knowledge will be more likely to recognize a stroke and helps themselves or other people to get early medical attention. Medical personnel with good knowledge of stroke will be less likely to miss the diagnosis even when the symptom was atypical. Delay in treatment resulting from poor knowledge regarding symptoms and signs of stroke may lead to a poorer prognosis. The aim of our study is to assess the knowledge regarding the symptoms and risk factors of stroke from both medical and nonmedical personnel, then compared the knowledge between them. This study was conducted in January 2018 in Jakarta, Indonesia. This was a cross-sectional observational study using a questionnaire. We assessed the knowledge about signs, symptoms, and risk factors for stroke through a questionnaire in the Indonesian Language with a minimal amount of technical jargon. The questionnaire consists of the questions with multiple choice answer and checklists. The sample was taken randomly consenting participants from both medical and nonmedical personnel in Jakarta, Indonesia. The analysis was performed to assess the difference in knowledge between medical and nonmedical personnel; subsequent analysis was performed between doctors and other medical personnel. There were 113 respondents, 49 has a medical background (11 were medical doctors) and 64 was from a nonmedical background. Information from the questionnaire was coded and entered into IBM Statistical Package for Social Sciences (SPSS) Statistics for Windows, (Version 24.0, Armonk, NY: IBM Corp., USA). The difference in knowledge between medical and nonmedical personnel; doctors, and other medical personnel were compared using the Chi-square test. The mean difference (continuous variable) was analyzed using t-test. In a question regarding nonmedical personnel subject's knowledge about stroke according to him/herself, 37 (57.8%) respondents said they knew well about it. Fifty-five respondents (85.9%) knew about hemiparesis. Twenty-one respondents (32.8%) knew about hemihypesthesia. Thirty-seven respondents (57.8%) knew about the uneven face. Twenty-nine respondents (45.4%) knew about dysarthria. Only seven respondents (10.9%) knew that sudden loss of vision is a symptom of stroke. Mean for knowing some risk factors out of 5 was 2.33. Twenty-five respondents (39.1%) knew that older people are at higher risk for stroke. Eight respondents (12.5%) knew that gender is a risk factor. Seventeen respondents (26.6%) knew that arrhythmia is a risk factor. Eleven respondents (17.2%) knew that family history plays a part. 18 respondents (28.1%) knew that smoking increased the risk of stroke. 42 respondents (65.6%) knew that hypercholesterolemia was associated with stroke. As for hypertension and diabetes, 50 respondents (78.1%) and 10 respondents (15.6%) knew that they were risk factors for stroke. Nobody knows that menopause is a risk factor for stroke. Mean for knowing some risk factors out of 9 was 2.77. 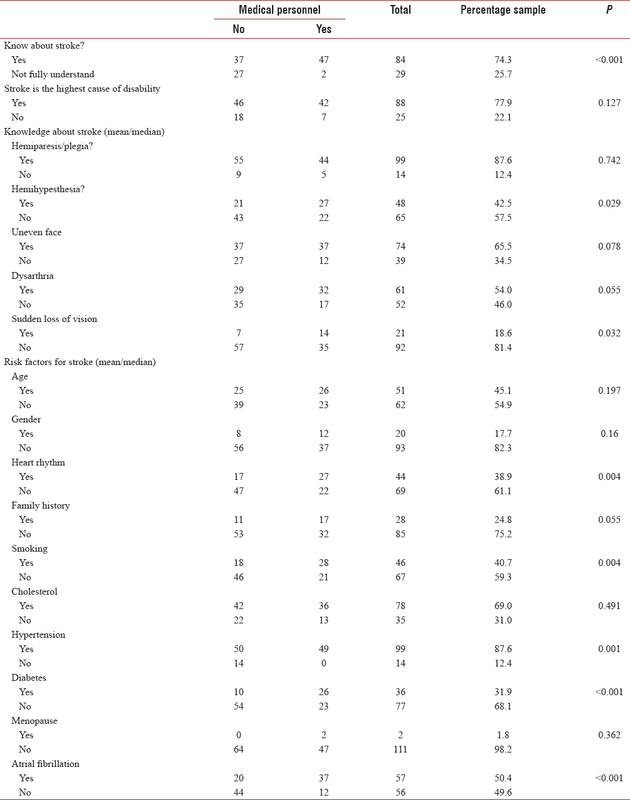 In a question regarding a subject's knowledge about stroke according to him/herself, medical personnel were more confident about their knowledge (P < 0.001) [Table 1]. The difference was also statistically significant in hemihypesthesia (P = 0.029) and sudden loss of vision (P = 0.032). The difference was not statistically significant when assessing hemiparesis, dysarthria, and uneven face (P = 0.742, P = 0.055, and P = 0.078). The difference was significant when assessing several risk factors such as arrhythmia (P = 0.004), smoking (P = 0.004), hypertension (P = 0.001), diabetes (P < 0.001), and atrial fibrillation (P < 0.001). Disappointingly, both performed poorly in recognizing menopause as a risk factor (0 in nonmedical vs. 2 in medical, P = 0.362). The difference was not significant in knowing that age (P = 0.197), gender (P = 0.16), and cholesterol (P = 0.49) as a risk factor. The difference in knowing symptoms (out of 5) and risk factors (out of 9) are 0.815 (P = 0.004) and 1.76 (P < 0.001). The difference in knowledge between doctor and other medical personnel was slim, with only menopause the only differing factor (P = 0.047) [Table 2]. Among the nonmedical personnel, hemiparesis was the most well-known symptom of stroke. Hemiparesis is one the most familiar symptom of stroke among the general population, be it on films, movies, or regular conversation. Half knew that uneven face is a sign of stroke; it is one of the components of the acronym “FAST” which is often promoted in Western countries. It is less frequently heard in Indonesia. The acronym “FAST” in the Indonesian language should be broadcasted more frequently for a public audience to see. Fewer knew that hemihypesthesia is a symptom of stroke, possibly because the symptom is less alarming than hemiparesis, nonmedical personnel, especially the less educated individual, may mistake it for “fatigue.” Only a small fraction knew that sudden loss of vision is a symptom of stroke, this should be more emphasized since it might be an episode of transient ischemic attack which further increases the risk of subsequent stroke. Most did not know that arrhythmia (atrial fibrillation) is a risk factor for stroke, atrial fibrillation itself was mostly unknown among nonmedical personnel. However, there was atrial fibrillation campaign in recent years, and it is hoped that more will be aware of atrial fibrillation. Hypertension was the most popular risk factor for stroke in our sample, but only minority knows that diabetes and smoking are an important risk factor for stroke. Almost all of the medical personnel knew that hemiparesis is the presenting symptom of stroke, the knowledge was excellent in both medical and nonmedical personnel. Only a small fraction of medical personnel knew that sudden loss of vision is a sign and symptom of stroke, although they perform reasonably well when compared to nonmedical personnel, it is still a disappointing result. Medical personnel was better compared to nonmedical personnel in identifying atrial fibrillation, diabetes, hypertension, and smoking as risk factors. Despite a better result, only 26 out of 49 correctly identifies diabetes as a risk factor. Diabetes is one of the major risk factors for stroke, and all of the medical personnel should be able to identify it correctly. However, the result is most disappointing in menopause, as only 2 out of 49 medical personnel know and did not perform better compared to nonmedical personnel. Subsequent analysis found that only menopause was significant for the difference in knowledge between doctors and other medical personnel, which means that the knowledge about stroke is still poor. The knowledge regarding the symptoms and signs of stroke other than hemiparesis was poor, especially regarding the sudden loss of vision. The most popular risk factors are hypertension and hypercholesterolemia. However, respondents lacked the knowledge about other risk factors. The result that the medical personnel can only recognize symptoms slightly better than the nonmedical personnel was slightly disappointing, and both performed relatively poor in answering questions. This is a wake-up call to emphasize the importance of stroke, its prevention and early recognition. We would like to thank those who had participated in our study. Feigin VL, Norrving B, Mensah GA. Global burden of stroke. Circ Res 2017;120:439-48. Feigin VL, Krishnamurthi RV, Parmar P, Norrving B, Mensah GA, Bennett DA, et al. Update on the global burden of ischemic and hemorrhagic stroke in 1990-2013: The GBD 2013 study. Neuroepidemiology 2015;45:161-76. Ministry of Health. Sample Registration Survey (SRS) 2014. Balitbangkes Kementerian Kesehatan; 2014. Powers WJ, Rabinstein AA, Ackerson T, Adeoye OM, Bambakidis NC, Becker K, et al. 2018 guidelines for the early management of patients with acute ischemic stroke: A Guideline for healthcare professionals from the American Heart Association/American Stroke Association. Stroke 2018;49:e46-110. Emberson J, Lees KR, Lyden P, Blackwell L, Albers G, Bluhmki E, et al. Effect of treatment delay, age, and stroke severity on the effects of intravenous thrombolysis with alteplase for acute ischaemic stroke: A meta-analysis of individual patient data from randomised trials. Lancet 2014;384:1929-35. Sorensen AG, Ay H. Transient ischemic attack: Definition, diagnosis, and risk stratification. Neuroimaging Clin N Am 2011;21:303-13, x.
Chen R, Ovbiagele B, Feng W. Diabetes and stroke: Epidemiology, pathophysiology, pharmaceuticals and outcomes. Am J Med Sci 2016;351:380-6.